Now, if you live somewhere warmer than the Northeast and have already moved on to fall greens and apples, good for you: we're hot on your tail. 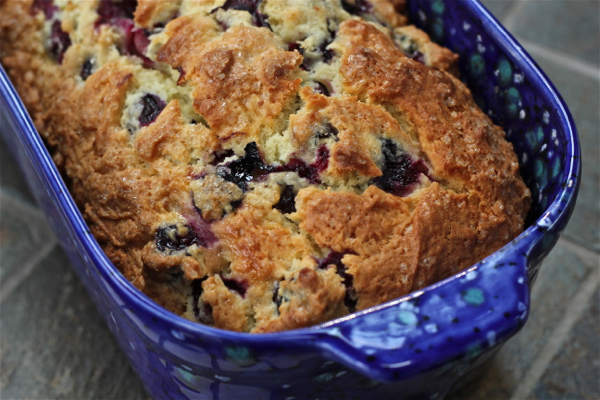 But this recipe is still for you, as it works well with fresh or frozen blueberries. 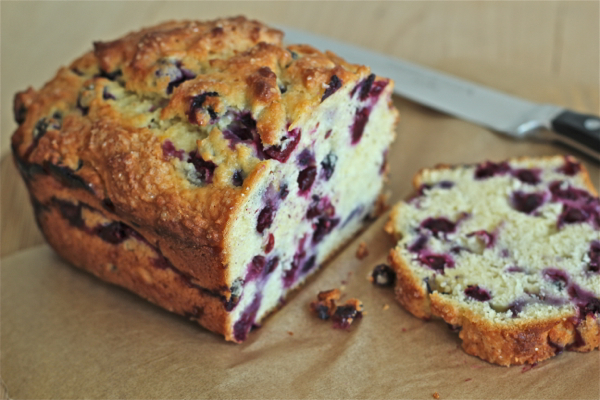 Perhaps the thing I like the most about this blueberry bread is that it is very dense and not too sweet: it is not cake masquerading as breakfast bread. You could easily toast it a bit and slather it with butter and it would totally stand up to that. But it's truly lovely eaten just as is, still a little warm from the oven. I just don't think it would be very good with a pumpkin latte. Note: You can use whatever zest you like but, having tried them all, I think orange is the best in this particular recipe. In a bowl, whisk together the flour, baking powder and salt. Remove one tablespoon of the flour mixture and toss it with the blueberries in a separate bowl; set that bowl aside as well. With a mixer (stand or hand), cream together the butter and sugar. Add the eggs and mix until well blended, then mix in the orange zest. Add the flour mixture and blend until just incorporated. On a low speed, blend in the yogurt. Then gently, BY HAND (don't use the mixer), fold in the blueberries. Spoon the batter into a prepared loaf pan and sprinkle the top with coarse sugar. Bake for about an hour and 5-10 minutes (start checking at an hour) or until the top is browned and crunchy-looking and a tester comes out clean. Let cool for about 10 minutes in the pan before removing the loaf and cooling on a wire rack. Yum, that looks super tasty. Down here it's still summer...well, except at the craft store where they have their Christmas stuff out.